I don't completely agree with you about the indices missing in Exhibition catalogs. Such works DO need indexes in ALL cases since these books are frequently cited in writing that concerns specific art works, when and where they were shown and who said what about them. It's not a cultural problem but an economic one; publishers save money by skipping this step. It's even less excusable in the age of computers because any desk top computer can generate a word list that the index creator can then pare down. One of my former mentors (Harvard, Berkeley Theological Seminary) used to thunder: "Books without an index should be MACHINE_GUNNED!!" (along with appropriate hand motions). Cheers for the review M! I'm interested to know more about these 'historical essays' and how Fried's theoretical piece interacts with them. Great catalogues (and the exhibitions they represent) have a common thread through their disparate elements, is there anything like that in this catalog that links the historical pieces with Fried's theoretical exploration? @Bob – it seems pretty slack for Yale Press to let this one out without an index – this detail alone woud decrease the allure of the volume to educators/researchers in particular, who need to track down specific items quickly. You made an index?? That's awesome. You know, people get jobs writing indexes for books. Ha ha! Bob, I like what your former mentor used to say about books without an index. 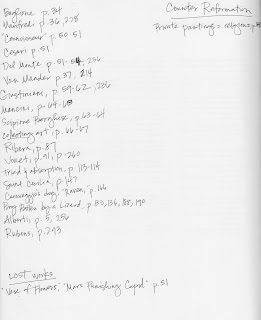 Yes, I do think that indexes are very important for these kind of books. And you bring up a good point: the lack of an index might be an economic decision more than a cultural one. That definitely is a motivating factor, probably for the publishers as much as the museums producing the catalogs. I do think, though, that there wasn't as much of a need for indexes in exhibition catalogs that were produced several years ago. It seems like there used to be less scholarly interest in exhibition catalogs – they sometimes would include cursory information about an artist alongside fantastic reproductions from the exhibition. Today, though, I think that there is now more of a scholarly emphasis in many catalogs. 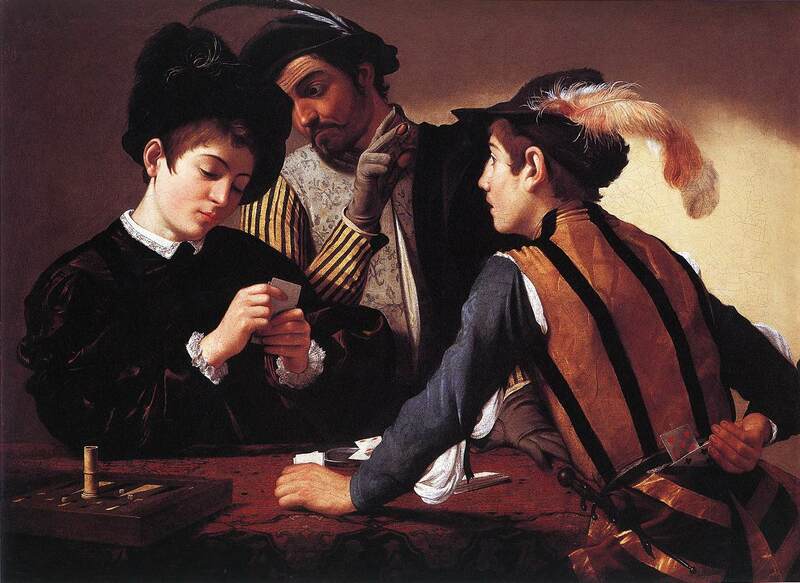 H Niyazi: Fried's essay focuses on a pictorial "system" developed by Caravaggisti painters. 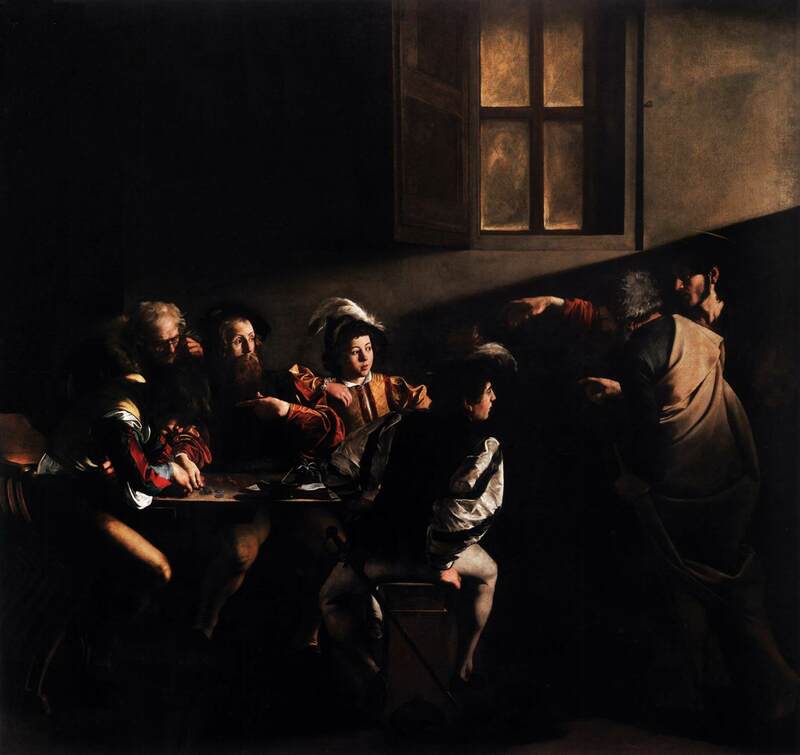 For example, he looks at how the Caravaggisti oriented figures in their canvases. In one section he points out how the depiction of a figure "largely from the rear" was a popular Caravaggesque motif. Then Fried explores how this "system" affects the relationship between the viewer and the painting. Granted, there are some historical strains in the essay. 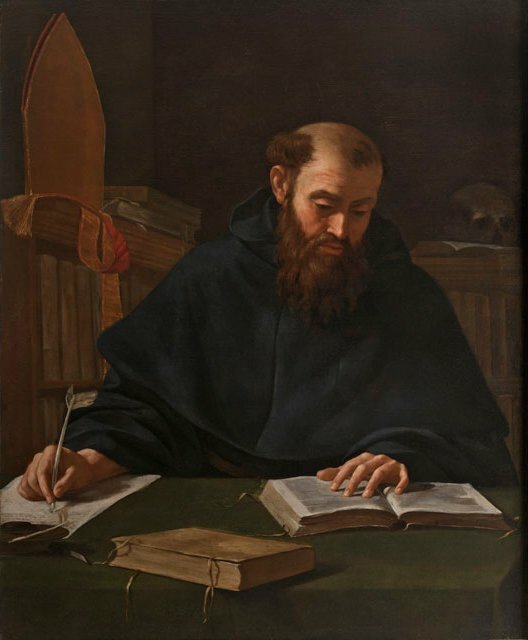 For example, he says that "the invention of absorption as a pictorial resource took place in the 1590s largely, though not exclusively, in the art of Caravaggio" (p. 113). However, his essay is much less about history and more about art analysis and spectatorship. 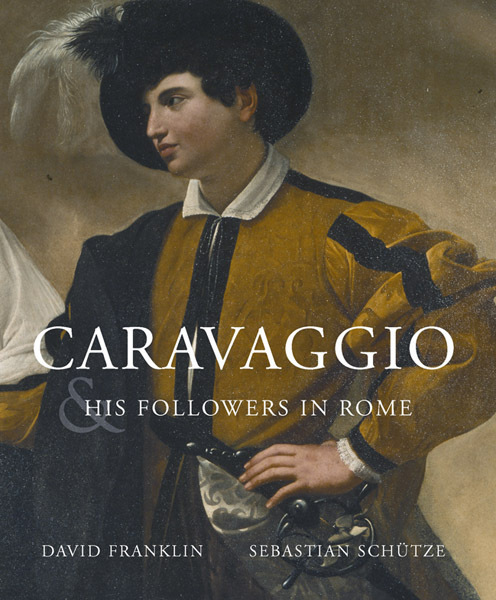 To give you a sense of contrast, the essay preceding the one by Fried relates documentation of Caravaggio's early followers from 17th century Roman parish registers. There is a stark contrast between the two essays! If anything, I think Fried's essay fits better with the thematic essays that are in the second portion of the textbook. These essays lends themselves to more visual analysis and exploration. Perhaps that's why Fried's essay is located at the very end of the historical essays; I suppose it can act as a precursor to the thematic section. heidenkind: Yeah, I made an index. What can I say? I'm a nerd. 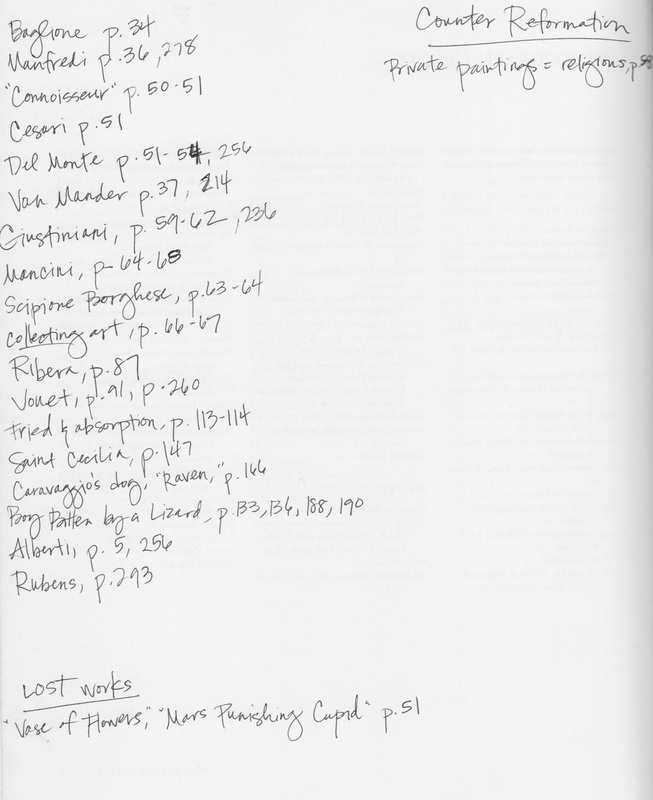 I often type notes on my computer while I read art historical texts, but this time I thought I'd keep the notes/index right inside my book copy. Anyone/everyone: Bob was kind enough to set up a Google documents spreadsheet with the index information that I have started. If anyone would like to contribute (or have access to) the index, please send me an email. I realize that this is a new book and not many people have copies yet, so please realize that my invitation to look at the spreadsheet is a standing offer. Perhaps we can collaborate and create an index ourselves! I love your use of the word "delicious" to describe the catalog! I'm sure it's appropriate, and your review made me hungry for more. Will we ever get tired of Caravaggio? It seems he gets more attention every year. I also love the idea of an interactive index on Google docs. I've never used the program, but what a great resource for this kind of collaboration. Is it being used a lot in education now (asked the dinosaur)?